Over the last year or so I’ve been asked about this story quite a few times so fitting with my model of reuse and generalization and having re-told it about 3 times in relatively quick succession over the Summer, I felt it was time to document it properly. I’ve never really been one to visually conform. Even at the age of 17 I remember a very polite but direct “talking to” from one of the staff at my school about the health risks of dreadlocks with regard to other students. 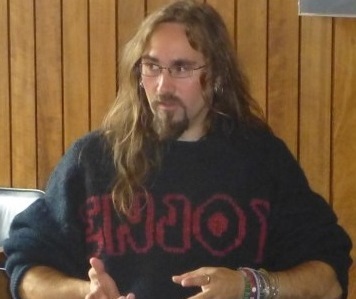 Admittedly the dreadlocks are long-gone now but the boots, long hair, beard, beads, rings and large hoop earrings have been with me for nearly 20 years with very little change other than the odd complete head-shave (mostly when working in industrial or hotel kitchens). In “smart mode” or in customer-facing environments, the earrings sometimes come out, the hair is tidied, the large boots are replaced with something smarter and the woolen jumpers are replaced with a jacket (usually velvet) and shirt but even then there’s something of the pirate persona that lives on. Strangely, Disney seem to have a lot to answer for. In my first couple of years at Oracle in the ’90’s the “behind-my-back” description of me was “The Lion King”. In May 2003 I moved to a Tech Lead role in Cambridge working with an exceptional development team. (They were following an incredible level of discipline mostly around XP technical practices in feature-teams). At about the same time, the hype engine was in full-flow for the first “Pirates of the Caribbean” film. And within my first month, the team had seen me in full-flow at the Cambridge Beer Festival. This rather bizarre collision of events triggered the most early “Pirate” and “Captain” references that I remember. Over the next 3 years, the “Captain” moniker stayed as did the good-natured pirate jibes. When I left this team we’d just relocated to a new office with a lake outside. My leaving present from them all was a radio-controlled pirate galleon with twin propellers and “real action cannons”. We took it out on the lake before I left and terrorized the aquatic populace. Sadly without a lake of my own, I don’t get to play with it very often any more. I moved on to a senior management role at a large well-known American conglomerate and switched to smarter clothes for a while. Not long after joining, I enjoyed another example of my continued non-standard appearance. I had the pleasure of meeting a delegation of leaders from the US at our Cambridge office. As introductions were made around the boardroom it reached my turn. I introduced myself politely and was greeted with a burst of laughter from our worldwide head of HR. She proceeded to explain that they had a presentation describing senior management diversity and the need to “break the mold” of the traditional polo-shirt, chinos, deck shoes, short back & sides style senior managers. Apparently there was a photo of a “traditional” senior manager at this company alongside one of me. Saying “less of these” (pointing to the traditional view) and “more of these” pointing to me. Unfortunately for them, I’m not clone-able yet. Only when we were some way into our agile journey with this group did the “Agile Pirate” name finally surface. One of my roles as an Engineering Manager was to define, improve and maintain our processes. As part of “owning” the processes for the site I led two of our early attempts at “agile adoption” with varying success (We were ISO certified so fitting agile into ISO was one early challenge. We succeeded and passed our certification). His direct action combined with an informal photo taken by him demonstrating the trial of our smart boards (a VC rig showing a call running between our UK and India development groups where the remote team stood life-sized in an image on one board, the backlog on a second and a sketchpad on a third) found its way across the Atlantic. His work became “the vision of the collaboration space of the future”, was widely circulated amongst senior executives and became the catalyst for funding a series of million dollar refits to our sites and the commissioning of an entire “state of the art” new software development site in our HQ city. Back in Cambridge the refit involved replacing servers, infrastructure, furniture, providing dedicated “war rooms” (many people hated that name) for each product group, electronic whiteboards, video conferencing rigs, whiteboards and lots of wall space. As part of the refit I pushed for “pair programming desks” – these were very large desks, big enough for 2 team members to comfortably pair at all day (each team member still had one of these to themselves so it wasn’t forced). It’s an old hospital building in Cambridge (not very old but architecturally dated). The offices are arranged over 4 floors with 2 long narrow wings (East and West) per floor. Each of the wings had a series of north and south facing rectangular windows at regular intervals. The top floor was generally open plan, the next floor down was a rented by a couple of other companies. The first (second if you’re in the US) floor was particularly “special” – each wing contained a series of “bays” – like old 4-6 bed hospital ward bays plus a selection of meeting rooms, test labs and server rooms it was like a rabbit warren. The bottom floor was mostly “executive” offices and meeting rooms. Our budget generally covered the team/meeting rooms and a refurbishment of the top and “special” floors. An early floor plan of the proposed refit from our architects was accidentally left on the printer one day. Unfortunately the placement of desks and windows combined with the shape of the building allowed a particularly creative (subversive) member of the development team to set-to work. A highly modified copy of the plan was found pinned to the top floor kitchen noticeboard depicting the office as a large galleon with slaves chained to the desks, oars coming out of the windows, assorted better-known office characters caricatured in various roles and a classic “no rudder” joke thrown in for good measure. Depicted stood at the helm was a “Crazy Agile Pirate” waving a cutlass. Thus the “Agile Pirate” name was born. Over the years after the refit, with the joke having been aired and the teams discovering that this wasn’t something new to me, things became more direct and open. After all, if you have some aspect of yourself that might be used for ridicule, why not simply milk it? I’d been blogging internally for my employer for some years, leading the internal team of agile coaches and had developed our worldwide internal agile community to a group of over 1,000 staff across all roles – from delivery team member to CIO. I felt however that I wanted to share what I was learning and seeing with a wider audience. In order to keep things safe for everyone involved in my experiences I preferred the added safety net of anonymity. (It was generally known and accepted that I was writing these articles but that they were (and still are) my own views and opinions and not affiliated to my then employer). Since then I’ve moved on and been “outed” a number of times however there’s still a small part of me that enjoys the potential anonymity of this site and that one day, I may choose to quietly hand the anonymous captaincy to others much like the Dread Pirate Roberts.